Your loved one or resident is changing. Your once gregarious, “life of the party” spouse is now reticent and restrained. Your college educated, thoughtful father is now forgetful and impulsive. And – perhaps the hardest situation of all – your once gentle and caring mother has begun to angrily lash out at caregivers, friends, and even family. The manner in which you once communicated with these individuals is no longer effective. 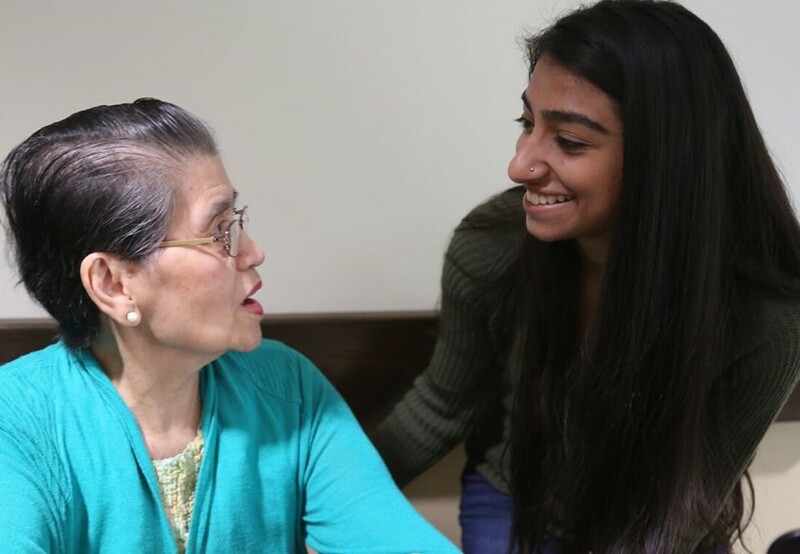 Comprehensive dementia care must consist of a new, inclusive way to share information with those individuals with Alzheimer’s and other memory affective disorders. One of the basic tenets of interacting with people with dementia is to stay positive. This can be hard! Your resident or loved one may feel anxious or unsure of themselves or their surroundings. However, it is important that you stay calm and be as reassuring as you can. One way of doing this is to have a handful of topics at the ready that you know the individual finds to be soothing. Talking about a favorite vacation, a beloved pet, or a special collection can help keep the conversation low key and pleasant for everyone. Remember, touchpoints for this person are likely founded on events from their past, so knowing these details can be especially helpful. KISS = Keep It Simple! Persons with dementia are easily distracted – a blaring television or radio, loud noises from the hallway or another room, even traffic outside can often derail a conversation. Whenever possible, limit as many of these distractions as you can. Try to interact in as quiet an environment as possible. Speak slowly and clearly. Use your resident or loved one’s name often. When you talk, keep your voice level and do not yell or shout. Use specific place and people names to ground the conversation and help keep the focus on the topic at hand. When communicating with a person with dementia, it can help to have non-verbal props to assist you. Personal items, pictures, or photographs can be shown to the individual to refresh memories. A special playlist comprised of a favorite musician or a preferred musical genre can help you break through the communication barrier. The use of a therapy animal (real or mechanical) appeals to the need to touch or stroke an object. Even the sense of smell can be extremely evocative! A favorite perfume or aftershave, or even a fragrant bouquet, can revive long-lost stories and act as a great conversation starter. An effective dementia care plan should include a wide variety of tools. Activities can help your resident or loved one to enjoy doing or talking about things from their past that continue to give them joy. Look for opportunities for the individual to be of assistance – tasks such as sweeping or vacuuming can make them still feel useful and give them purpose. Tending to a garden can be relaxing and fulfill a desire to be out-of-doors. Using prompting memory cards or creating an autobiography can create a sense of personal accomplishment, while also crafting a legacy to share with friends, family, and caregivers. Be patient with your resident or loved one, and use your “listening ears.” Give them time to form an answer. Accept their responses and do not try to correct them or convince them that they are wrong. Facts and figures may be confused or jumbled in their mind, and focusing on who is “right” can be upsetting. To truly be successful when caring for a person with dementia, you must dig in and discover what is most meaningful to the individual. When you know the person deeply, genuine and meaningful conversation results, supporting the individual’s care and well-being in a nurturing, holistic way. Remember to relax and enjoy your conversation. It should be a pleasurable experience for both of you – and that’s a true win-win for everyone involved! Front Porch Leads the Pack in Innovation!